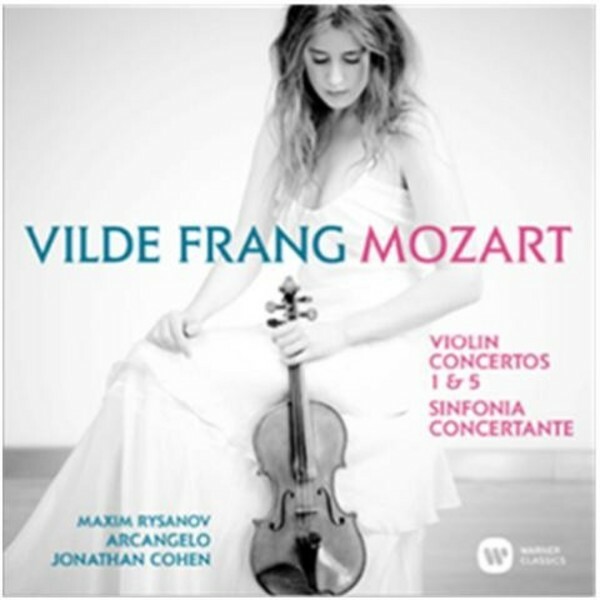 Following the success of her discs of Romantic and Late Romantic repertoire, Vilde Frang has now recorded Mozart�s Concertos Nos 1 and 5 �Turkish� and the Sinfonia Concertante K364, enabling music lovers to hear the Norwegian violinist perform Classical repertoire on disc for the first time. The impetus for this album was a 2012 orchestral tour of Asia conducted by Jonathan Cohen in which Vilde performed Mozart�s Violin Concerto No.5. The vibrancy of their musical collaboration was something both artists were keen to repeat and commit to disc. Jonathan�s Cohen�s chamber orchestra, Arcangelo, proved the ideal partner, joined by violist Maxim Rysanov in the Sinfonia Concertante. Today we tend to think of Mozart as a keyboard virtuoso but he was also an accomplished violinist. Indeed, in 1769, aged 13, he was appointed honorary concertmaster of the Salzburg Court Orchestra. For many years, it was believed that Mozart composed all five of his violin concertos in 1775, but analysis of handwriting and of the manuscript paper suggests the actual date of the first concerto, K207, was 1773. Filled with brilliant passage work, it is generally characterised by high spirits and is filled with dazzling semiquaver and demisemiquaver passages reflecting the influence of such Baroque Italian virtuosi and composers as Pietro Nardini, Pietro Locatelli and Gaetano Pugnani. Each of Mozart�s subsequent violin concertos, all composed in 1775, is longer and on a larger scale than the preceding one. By the fifth and last, he had created a work still clearly within the Classical concerto tradition yet, in terms of both length and technical demands, approaching the instrumental concertos of the century to come. The Concerto No.5 K219 is often referred to as the �Turkish� because of its frenzied Allegro section in the middle of the final movement. Vilde Frang, born in Norway in 1986, has established herself as one of the leading violinists of her generation, in demand for her musicianship and virtuosity and notable for her thoughtful interpretations and natural sense of style. Since her appearance with Mariss Jansons and the Oslo Philharmonic when she was twelve years old, her career has developed organically and on her own terms. She has appeared on the world�s leading concert stages with the most prestigious orchestras under the batons of the most admired conductors, as well as in recital and chamber music with such colleagues as Gidon Kremer, Yuri Bashmet, Martha Argerich, Janine Jansen, Leif Ove Andsnes and Maxim Vengerov. In 2012 Vilde was chosen to receive the Credit Suisse Young Artist Award, which sponsored her debut with the Vienna Philharmonic under Bernard Haitink at the 2012 Lucerne Summer Music Festival. Her recordings of concertos by Sibelius, Prokofiev, Nielsen and Tchaikovsky and sonatas by Grieg, R Strauss and Bart�k for EMI Classics, now Warner Classics, won Edison Klassiek and Classic BRIT awards, the Deutsche Schallplattenpreis, the Diapason d�Or and a Gramophone Award nomination. Under its founder, artistic director and conductor Jonathan Cohen, Arcangelo brings together exceptional musicians who excel on both historical and modern instruments and have a passion for faithful interpretation. Its members, many with flourishing solo and chamber music careers, value the collaboration required of chamber music as the highest expression of music making. Since its formation in 2010, Arcangelo has made a dramatic impact on the musical scene and has already recorded half a dozen albums to high acclaim, including a Gramophone award. Violist Maxim Rysanov was born in the Ukraine and studied there and at London�s Guildhall School of Music and Drama. Winner of the 2008 Classic FM Gramophone Young Artist of the Year award and a former BBC New Generation Artist, he performs widely in Europe, Asia and America. His chamber music partners include Leif Ove Andsnes, Nicola Benedetti, Martin Fr�st, Sol Gabetta, Janine Jansen, Gidon Kremer, Mischa Maisky, Victoria Mullova, Vadim Repin and Maxim Vengerov.